When you think of witches, spell books, cauldrons, and magic words all probably come to mind. In Bitter Night, Diana Pharoah Francis has taken witches and twisted them in ways that I have never read about before. It’s not often that I come across what I would consider an original idea in urban fantasy, but I give credit where it is due. Although I wasn’t completely in love with Bitter Night (the first in the Horngate Witches series), there were enough positive points in this book to make me eager to move on to the second in the series, Crimson City. Max (not her real name) has been the Prime Shadowblade for her witch, Giselle, for the last 30 years. It’s a long time to hold a grudge, but Max vows that when the moment comes, she will use every advantage to take revenge against Giselle for robbing her of a mortal life. As the Prime Shadowblade, Max has endured much pain to be forged into a nearly invincible weapon to protect Giselle and Horngate, the place that they call home. When Max discovers that the Guardians of earth are planning to wipe out all of humankind, something awakens inside of Max. Though it has been 30 years since she has seen her family, they are worth fighting for–even if they do not know that she is still alive. The Guardians need the witches to side with them, but Max will do anything–including making an alliance with the Prime Shadowblade of another coven–to see that their plans fall through. Bitter Night was a bit of an uneven read for me; I thought the characterization was superb, but the world building to be lacking. Max is a main character that I can root for; she showed a tremendous amount of growth from the first page to the very last, and her pain and rage felt very real to me. She is tough, but she also has a soft side that begins to come out when she meets Alexander, the Prime Shadowblade for Giselle’s enemy, Selange. I found myself a bit lost when it came to the world building. I would have liked more explanation as to the origins of some of the supernatural creatures, especially the witches. Near the end of Bitter Night, it is mentioned that witches have human family members, which led me to wonder if witches are born or made, and if they are made, what kind of process that involves. After reading the description for Crimson City, I am thrilled to see that Francis will be taking the series in the exact direction that I had hoped that she would. Throughout Bitter Night, Max talks several times about the family she left behind, and I hoped that they would make more of an appearance in future books. I really like to read,and I thought that this book was really great! I would love to read this book. I thought your review was very thorough and interesting. Thanks for posting! This sounds like something I’d really enjoy. this sounds exciting! i don’t always read paranormal romance but this sounds good! Sounds interesting and different. I like it when we get to see and feel character growth in books and tv shows but this plot seems pretty drawn out and confusing. It will be interesting to see how this series does. I have tried to read other books about witches and I just can’t seem to get into them. This one sounds like another one I would have trouble with. It sounds like the only good part is about Max. Looks like a book I might have to check out. So hard to find a good read these days. This sounds a bit strange for my tastes but I sometimes enjoy books that are a little “out there”. If this one is enjoyable, then I would read Crimson City for sure. This was an excellent review, giving the flavor of the book without revealing too much of the plot! Thanks for the review. This sounds like a great book. 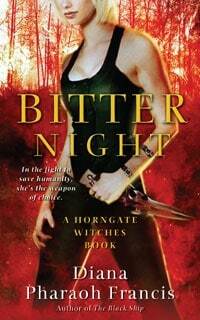 I like this sort of Urban Fantasy theme – this might be a good addition to that category on my TBR shelf! I’m intrigued! I haven’t read too many books with Witches but I think I would like to give this one a try. Enjoyed your review!